Personal hygiene was highly valued in ancient Egypt. The Egyptians would bathe daily and would incorporate lotions, makeup, deodorant and breath fresheners into their regular routines. Some of these ointments would be purely cosmetic, but many had medicinal and otherwise beneficial properties. For instance, certain oils and lotions could be sun protectants, while others would soften skin, or even repel insects. Makeup often had such a dual role, with beautification a side benefit of the more vital advantages of well-being. Such is certainly the case for kohl, or black makeup, which was ubiquitous in ancient Egypt, as is attested on the eyes of gods and humans alike throughout all of Egyptian art. To produce kohl, the mineral galena, sourced in the Sinai mountains, was ground down into powder which was then mixed with oil or fat into a thick cream. Surrounding the eye with this thick eyeliner was known to protect the eyes from infection and flies, as well as from the harsh sunlight, much the way an athlete uses a smudge of ‘eye black’ to reduce glare. Cosmetic vessels were especially important personal effects for these essential daily ointments and remedies. 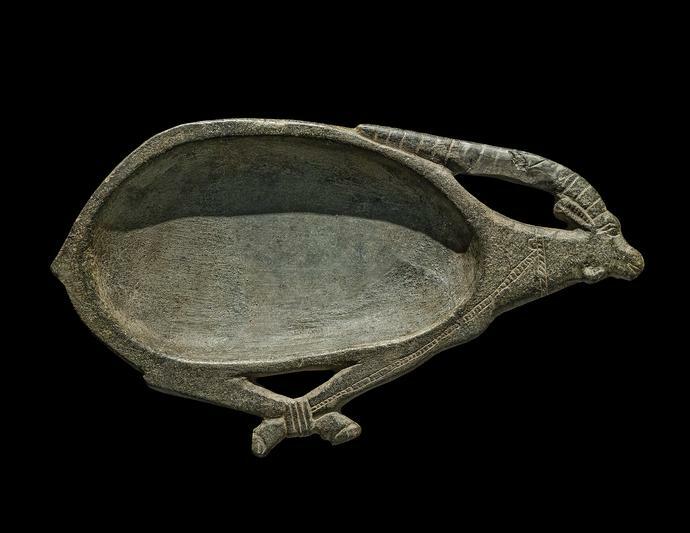 This delicately sculpted dish is one such valuable, which would have been utilized in life, perhaps to scoop out or gather such creams or unguents for use, which then would have accompanied its devoted owner into his or her tomb as well. In fact, not only were these highly prized vessels brought into the tombs of the deceased, but the ointments, oils and makeup themselves were even placed among their goods in preparation for their use in the afterlife. 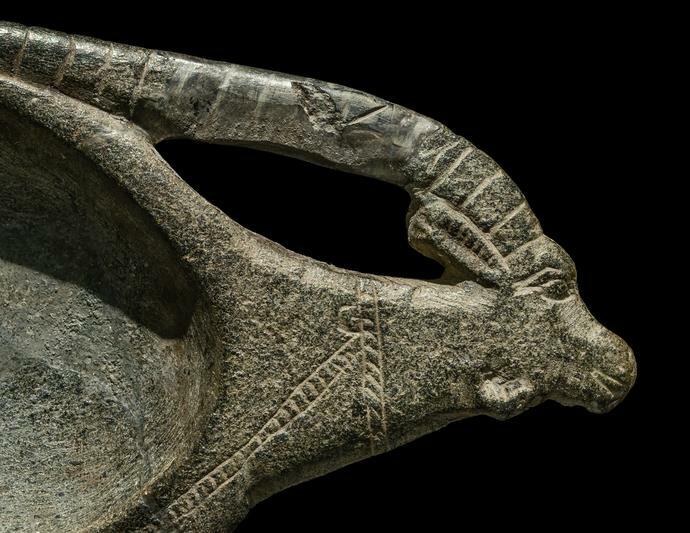 The bowl of this vessel forms the body of an ibex, with its head, horns and bound legs intricately carved in openwork and further embellished with fine incision. 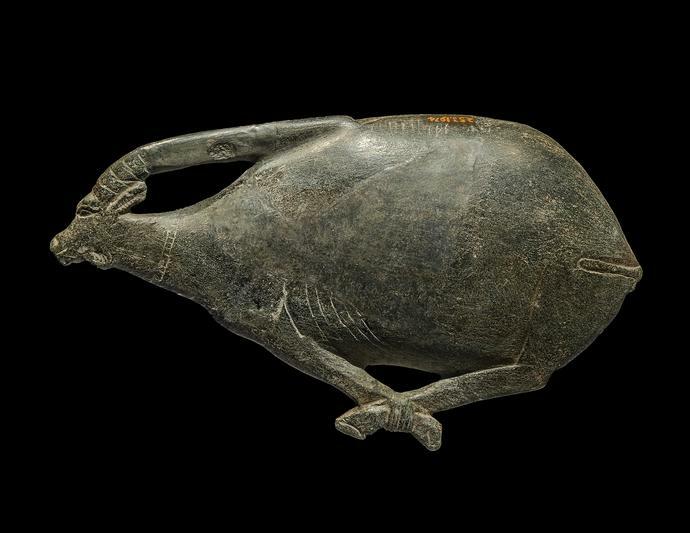 From the reverse, the vessel gives the illusion of a sculpture in the round depicting the ibex from the left side, while the hollowed bowl encompasses the right side of the ibex’s body. The ibex was amongst the wild game that inhabited the steppe environment of the Nile Valley in antiquity. It was often hunted, along with the gazelle and oryx, and therefore comes to be depicted in Egyptian art already captured, as here, with its legs bound. apturing an ibex was a sign of valour, and therefore its appearance on an item from one’s toilette would celebrate the owner’s high status and dominance over nature. The ibex was also considered to be a talisman of good-luck, often associated with the New Year. This compelling cosmetic vessel has been exhibited and published multiple times as part of the prominent collection of the renowned scholar William Kelly Simpson, who died in 2017 after a long and prolific career in Egyptology. He was revered for his impeccable taste and connoisseurship. His great knowledge has touched generations of students and colleagues, and as his collection disseminates, a part of his vibrant spirit continues to inhabit each piece.